And the impact SIAM has on tooling and processes, as well as the people who implement them. Although the demand-supply governance of outsourcing has been a high priority on the agendas of CIOs for over fifteen years, recently, at many organizations, a complex landscape has been created in which a large number of suppliers have to work together to deliver good quality services to the user organization. The rise of cloud computing, agile working methods and the further automation of IT management and operations are all drastically changing the way in which customer organizations and IT services providers work together. Service Integration, Automation and Management (SIAM) was introduced to manage this changed and complex landscape SIAM is aimed at coordinating and integrating the different services provided by multiple suppliers in such a way that customers feel like they are dealing with a single supplier. In this white paper, we examine what SIAM actually is, and how you can realize a ‘House of SIAM’ that works optimally and delivers services that are integrated, well coordinated and consistent. What impact does this have on tooling and processes, as well as the people who have to implement them? What are the most important building blocks and best practices for designing a House of SIAM? Due to the increased outsourcing of IT to growing numbers of suppliers, and the ever-rising dependency on properly functioning IT, at many companies, there is an increasing need for the services delivered by suppliers to be optimally coordinated and integrated. This need is becoming even more urgent as a result of the interdependency that exists between the individual IT components and the high dependency on certain suppliers. In this regard, vendor lock-ins sometimes make it impossible to switch quickly from one supplier to another. Integrating services is however, no easy task given the necessity for suppliers to work in-creasingly more efficiently and, preferably, to deliver services that have been standardized as far as possible, especially where commodity services are concerned. Moreover, supply chains are becoming ever longer: many suppliers work with sub-contractors that deliver important sub-services which have to fit in seamlessly with one another in order to deliver a complete service to the customer.Fortunately, the pluriform supplier landscape also provides new opportunities for obtaining better services. Modern service management tooling makes it possible to integrate the tooling of suppliers, further automate the delivery of services, and more effectively and efficiently analyze the large amounts of data derived from the various suppliers. This explains the rise of Service Integration, Automation and Management, SIAM for short. SIAM is emerging as an increasingly more important capability for both IT governance organizations and larger IT suppliers. The literature that is currently available on SIAM places particular emphasis on supply integration. This refers to how the services provided are integrated to form a structurally consistent package of services delivered to the business. However, this emphasis does not do justice to the complexity of the context involved. Demand from the business must also be integrated so as to optimize the scale of the IT provision. If this is not done, demand from the business quickly results in the delivery of customized services, creating diseconomies of scale which in turn makes the services provided unnecessarily expensive. The integration and standardization of demand is thus essential and, due to the rise of working methods based on Agile and DevOps, seamless demand-supply integration is actually of vital importance. Another shortcoming of the current literature is that authors tend to treat SIAM problems as if all supplier organizations are standardized. However, with the emergence of increasingly more – and different – delivery models (like Agile, DevOps, SaaS and PaaS) greater and greater diversity is being created in how services are delivered. This is an additional challenge when integrating services: how do you integrate services that were developed based on agile software development methods and while also making use of a PaaS cloud service and an on-premises legacy system? This example alone involves three different service providers that use three different delivery models, while they also make use of different networks. At the same time, the main priority is to prevent security incidents. How do you ensure that, if security incidents do occur, they are resolved as quickly as possible? And, how do you know if the reporting of one supplier is in line with that of another? In this complex and business-critical context, there is an urgent need for SIAM best practices to be shared. In this white paper, we treat a number of these best practices and, most importantly, we provide a framework within which existing best practices – as well as new methods that are still to be developed – can be set down. The exchange of data between the various parties involved in SIAM should ensure that the meaning of the metadata regarding the service delivered is attributed consistently by both the sender and receiver. This framework makes it possible to reduce complexity, and to increase the quality of both service demand and service provision. Since SIAM is a relatively new concept, there are still many definitions in circulation that differ fundamentally from one another. 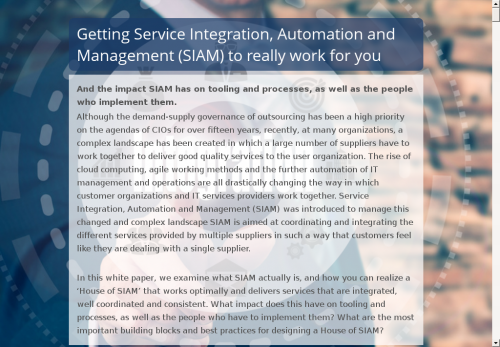 In this white paper, we use the following definition: Service Integration, Automation and Management (SIAM) is a concept in which different services provided by multiple suppliers are coordinated and integrated in such a way that, when services are delivered, it feels like they came from a single supplier. In Quint’s vision, the aim of SIAM is to convert the interdependent and conflicting requirements of the business into integrated services, so that customer requirements are met and, ideally, customer expectations are exceeded. These integrated services are compiled from the services provided by internal and external suppliers. A number of challenges lie concealed in the objective of SIAM. The business has interdependent and conflicting requirements. Whereas one part of the business requires speed, another part prefers reliability and security. SIAM is all about achieving the right balance between these different needs. This balance will vary from service to service. Integrating services provided by multiple suppliers. The more suppliers involved, the more difficult it is to deliver integrated services. Each link in the chain might turn out to be the weakest one. The interests of the various suppliers may conflict with one another or with the interests of the business. Increasingly rapid changes in demand make the SIAM chain more vulnerable because a status quo can almost never be achieved. Exceeding expectations. Simply fulfilling the requirements is difficult enough. However, true customer satisfaction is only achieved when expectations are exceeded because more value than was agreed is delivered. The term SIAM was originally introduced in the IT domain and, in particular, by service providers and tooling suppliers as a means of tackling the above challenges. In the first instance, the aim was to gain more control over information regarding the delivery status of services. However, we firmly believe that, ultimately, customers (who, after all, continue to have final responsibility) should also manage demand with a focus on integrating demand, by making optimal use of the available information and the integration suppliers can provide. We are living in times in which much is changing in how IT is realized. The emergence of cloud computing and agile working methods are resulting in rapid changes in how we do business and the forms of partnership we choose. While in the past supplier relationships were relatively stable, switching supplier must – and can – now take place much faster. And yet, the human factor in realizing and integrating IT services definitely remains just as important as ever. Therefore, when discussing best practices for SIAM, we do not limit ourselves to tools and data streams, but also specifically take into consideration aspects like governance structures and dominant behaviors. SIAM also involves controlling, managing and improving competencies and sustainability. This is becoming increasingly important and more challenging given that we have a landscape in which IT is being changed at different speeds. Ultimately, all changes tracked should be aggregated in, for example, a single dashboard. All operational data should flow into this dashboard and the desire to have a single up-to-date version of the true status of service delivery should be fulfilled. SIAM closely resembles demand-supply governance (DSG)1. Both concepts focus on managing and delivering services to the business. Traditionally, the focus in SIAM is on integrating services provided by suppliers and improving the interaction between customers and suppliers. In this white paper, we also use DSG concepts when looking at demand integration. Although SIAM was introduced in the IT domain, it can be applied in all domains in which services are integrated. The use of SIAM in these other domains lies beyond the scope of this white paper. We have observed that successful SIAM requires a ‘house’ in which collaboration takes place on different ‘floors’ (see the figure below). This House of SIAM is focused on integrating the sub-services of all kinds of internal services (shared services) and external (outsourced) services (including cloud services) into an IT services chain that contributes effectively to business processes. The SIAM organization feels responsible for the end-to-end delivery of services to the business, based on the agreed KPIs, and it also has a good overview of the suppliers’ day-to-day management. To create an effective SIAM organization, processes, contracts and technology (service management) need to be integrated in terms of design and implementation. Typical of such a SIAM organization is that it has a collection of integrated service management tools available that receive information from all underlying parties. In this way, a single source of truth is created, with service management information that contains data on the performance of these IT services. In addition to this technology, the SIAM organization needs to have staff available who are capable of managing operational processes and can serve as a bridge between the business (demand) and the underlying suppliers (supply). A successful SIAM implementation involves a number of general starting points which we call fundamental principles. Some of these principles are universally applicable, while others apply to a particular floor of the House of SIAM. All parties involved in SIAM for a customer / end customer must have a strategy that focuses on the customer’s success, or the supplier’s strategy must be in line with the goals of the customer. The former particularly applies to suppliers that provide customized services and have a high degree of interaction with the customer. The latter particularly applies to providers of commodity services. In this regard, it is especially important for the customer to verify that the supplier is providing what the customer wants, and what the situation is concerning delivery reliability. A cloud supplier that suddenly ceases to provide services can endanger the continued existence of a customer. Agreements made with either the business or suppliers must all be in line with one another and derived from the strategy. Partnerships begin and end with insight into what needs to be achieved and if it is actually being achieved. If not, a kind of Tower of Babel situation is soon created. A good partnership needs shared insight into whether or not things are going well, and whether or not adjustments need to be made. Every partnership has ups and downs. Moreover, while working with the customer, insight is always acquired into whether more or less should be delivered – or that it should be delivered differently – due to turbulence on the market. And, the suppliers themselves may feel a need to deliver services slightly differently. This requires flexibility and resilience from all parties. You soon feel the squeeze in a straightjacket that’s too tight! It is therefore important to put customer satisfaction outcomes ahead of output (KPIs) and thus improve the partnership. All parties involved can work together optimally if there is transparency regarding their objectives, limitations, and activities performed and the outcomes thereof. Needless to say, all the individual parties have their own commercial interests and transparency is not desirable when these interests are involved. If these interests weigh too heavily in the balance and too many matters are kept hidden from one another, mutual trust is adversely affected. For this reason, in a House of SIAM, it is important that the parties involved make agreements on sharing information optimally via tooling, without the data used for the tooling being manipulated. A House of SIAM is all about hospitality, taking responsibility and providing transparency. However, just like in a real house, house rules have to be clearly communicated so that everyone knows what’s what. Ensure that everyone is familiar with the agreements (refer to the second principle above) and that that there is real contact between the ‘residents’ of the house. In a complex landscape, good cooperation requires a uniform and agreed data model. In this regard, be aware that the customer is – and remains – the owner of the configuration management database (CMDB) and all performance data. It may be a cliché, but standing still means going backwards. Incremental improvements are always possible, definitely in times in which new, improved technologies are emerging at a lightning-fast pace. Regardless of if you are working with Agile or a more traditional approach, processes must have clear touchpoints, and responsibilities that are properly aligned across all parties (end-to-end). To this end, use consistent vocabulary and a collection of uniform definitions, and deploy the right people, at the right time and the right place. This principle involves the ‘license to operate’ concept. Just like in a real house, in SIAM it is vital that the house is in good order. Operational services and architecture must be properly organized. Tactical and strategic operations management is only possible when there is control over operations. You can outsource implementation but not responsibility. However, taking responsibility does not mean adopting ‘step-in’ behavior whereby the customer takes over a portion of the services of suppliers or compensates for them. Suppliers will, however, have to act beyond the boundaries of their own service level agreement in order to deliver the composite service in compliance with the agreements made. To clarify how a House of SIAM works, we have set down the aspects of the different floors in further detail. An explanation is given later on. Cooperation: people aim to achieve a common goal, even if this goal is of direct importance to one of the other parties; they do not begrudge each other success. Delegation: authority and responsibility are transferred to the suppliers in a clear way and ‘step-in’ behavior is avoided. Vision: the focus is on the main lines and there is a long-term plan in place; people dare to distance themselves from the commotion of daily activities. Leadership: managing both individuals and groups and providing them with direction so that cooperation is effected and maintained. This requires the powers of persuasion needed to motivate people and convince them that the chosen direction is the right one. Planning and organizing: determining goals, actions and priorities, including the time and resources required to realize them and to ensure that they are actually performed and maintained. This aspect also involves overall governance whereby goals are translated into actions – and vice versa – at the strategic, tactical and operational levels. Capacity to learn: being able to process new information time and again, and apply it. Problem analysis: recognizing problems, and searching for and identifying the underlying causes and possible solutions. Particularly in complex SIAM environments, this requires the ability to deal with a lot of details skillfully and appropriately. Flexibility: being able to alter patterns of behavior to suit conditions that have changed (positively or negatively) in order to achieve the set goals. Customer oriented: see above under “Customer-and-supplier oriented”. Integrity: respecting generally accepted social and ethical norms when realizing and delivering services, and providing transparency regarding commercial interests. Planning and organizing: see above under “Planning and organizing”. Capacity to learn: see above under “Capacity to learn”. Stakeholder awareness: keeping abreast of facts related to customers and views held by customers and their stakeholders, and using this knowledge effectively for both the customer’s and one’s own organization. Problem analysis: see above under “Problem analysis”. Ambition: having the aim of providing even complex services, or providing services of a higher quality than agreed, so that one’s own organization and the customer’s are both successful. The IT4IT concept is becoming ever more important due to the increasing automation of IT. This involves the automation of IT processes (like robotic process automation, RPA) and the integration of IT processes and systems used in various IT value chains. IT4IT is providing increasingly more tools and systems which are used to keep the provision of IT services secure, reliable and efficient. IT4IT is, in fact, the engine room of a House of SIAM. It makes service integration possible so that the management of services becomes a well-organized and performable activity, regardless of whether it concerns issuing rights, measuring usage, detecting outside attacks targeting confidential information. The concept of SIAM would probably not exist without IT4IT, but without SIAM, IT4IT would degenerate into useless amounts of data which would drown everyone. As mentioned earlier, it is ultimately the customers’ responsibility to manage integration. In so doing, they make optimal use of the available information and the integration that suppliers can provide. In a House of SIAM, all these integration areas are neatly grouped in value streams. Plan SIAM: all integration areas that together lead to an IT strategy (that is derived from the business strategy) and is set down in concrete roadmaps. Build SIAM: the integration areas that lead to services realized by the selected suppliers by means of completing projects and changes. In this stream, increasing attention is paid to agile working so that Operations is involved as much as possible (DevOps). Further to this, refer to the box “The relationship between Agile & DevOps and SIAM”. Run SIAM: ultimately it’s all about delivering operational services. This stream is focused on, among other things, continuous improvement, resolving incidents, responding to queries and delivering standardized changes and services. Finally, the increased importance of actually measuring usage and continually monitoring security are part of this stream. A short description of each integration aspect is given below. IT Strategy: In strategic partnerships, it is important that suppliers’ strategies and the customer’s strategy remain in alignment. Changes to the strategy of a supplier should be able to be considered by the customer. Architecture: Creating and maintaining an integrated landscape for information provision, applications and infrastructure, including guidelines for technology, standards, version policy, etc. Innovation among suppliers or by the customer usually requires the modification of one or more of these components. To continue to safeguard the alignment of a supplier’s service with the overall service provided, the enterprise architecture needs to be regularly aligned. This enables the customer and the suppliers to anticipate changes early. Sourcing: The IT strategy and market developments are used to determine the sourcing strategy: for which services / types of services will external providers be sought, and what requirements must these suppliers meet? The sourcing strategy delivers important input for the contractual agreements made with suppliers. Management of the sourcing lifecycle and the design of the SIAM relationships and processes both flow on from the sourcing strategy. Project Portfolio:The total number of and the progress made in projects that customers are realizing with the support of their suppliers regarding developing, changing and implementing IT services. Service Portfolio: The alignment of the development of IT services delivered to the business and the lifecycle management of the supporting technologies. Both customer and supplier can initiate changes. Finance: In terms of finance, in the contracting phase and thereafter, information is shared regarding financial aspects such as budgets, prices (including indexation and other pricing agreements), billing and possibly benchmarking to validate pricing. HR: Every customer-supplier relationship is based on cooperation between key executives who, in accordance with consultation structures, work with clear decision-making powers and mandates. These persons cannot be removed without the customer being involved. Furthermore, further requirements can be set by either the customer or supplier and laid down within HR (for example, in respect of training and screening). Risk & Compliance: The customer organization must at all times have an overview of the status of the requirements and the risks entailed in a (composite) service. Sourcing by definition means transferring a number of IT-related risks to suppliers (for example, risks related to HR, security, continuity and economies of scale). Periodic auditing of the supplier is usually part of the agreement. The requirements are also determined in part by the legislation and regulations with which the customer organization must comply. Capacity: Translating and coordinating demand from the business into the required capacity (people, materials and resources) including the planning in this regard in place at suppliers. Project:Harmonizing the coordination and management of a project, including agreements involving the project methodology to be applied and sharing information on projects. Requirements: Coordinating and prioritizing all the business and architecture requirements (including acceptance requirements) in terms of the options offered by suppliers in such a way that clear and feasible requirements for a new or modified functionality are formulated for each supplier. Design: Aligning the design or the user story with the requirements, and adjusting the requirements if necessary. Build: Coordinating the building of the individual components, building in the right order and adjusting the requirements and design if necessary. Test: The total sum of agreements on how the testing of new and modified IT services should take place, including performing tests. Change/Release: Coordinating, initiating, planning, approving, communicating and implementing changes. Service Catalog: Coordinating the suppliers’ service catalogs (and changes in them) so that the service catalogs are aligned with the needs of the business. Service Level: Harmonizing the frequency and manner of reporting on the agreed performance of the service provided by the supplier to the customer, including how the data should be delivered. Continuity: Coordinating the responsibilities for disaster prevention and agreeing on the procedures to be followed if a disaster occurs, and the periodic testing of these procedures. Vendor & Contract: Harmonizing and, if necessary, adjusting generic agreements with suppliers, including conducting an overall assessment of the suppliers (and suppliers doing the same in respect of their sub-contractors). CSI: Sharing information that is needed for continual service improvement. Feedback regarding the experiences of the users of the service provides useful input to this end. Event: Sharing information that is needed to determine the status of events, to communicate this and resolve them, and to assess the response to events. Incident: Sharing information that is needed to determine the status of incidents, to communicate this and to assess the solution. Problem: Sharing information that is needed to determine the status of problems, to communicate this and resolve them, and to assess the problem-solving capacity. Configuration & Assets: Sharing information that is needed to determine the status of configuration items (CIs) and assets, to communicate this and to assess if these items are being managed adequately. Request: Sharing information that is needed to learn the status of requests, to communicate this and to assess if requests are being handled quickly enough. Access: Sharing information that is needed to determine the identity of users and, based on this, to provide access to the service, included the rights concerned. Usage: Sharing information on the usage of IT resources. This constitutes the basis for the invoicing of these services. Security: Sharing information that is needed to safeguard the security of the service provision. Among other things, this requires insight into current and potential vulnerabilities, and an assessment should be made as to whether the right measures have been taken and if these measures are sufficient. For example, aspects like the frequency with which security audits are performed, data protection, agreements involving logical and physical access security, as well as making amendments to the security policy. The outsourcing of IT services requires setting down tight contractual frameworks. This seems to be diametrically opposed to the goals of Agile and DevOps. These approaches are all about working in teams in which roles are interchangeable so that good results can be achieved quickly for the business. Fortunately, the technological side of SIAM – the tooling which is used to automate many of the basic IT tasks, and the move towards IT4IT – makes agile working possible. The integration areas that ensure the realization of new and changed information systems can also be formulated in Agile terms. Requirements are also defined in Scrum in the period that precedes the period (sprint) during which they are delivered. Within Scrum, there are different levels of detail for requirements which are usually referred to as epics, features and user stories. Requirements are brought to the right level of detail (also known as ‘Ready’) in a session known as backlog refinement. The requirements can then be picked up by members of the Scrum team and completed/delivered in the direction of ‘Done’. Before the start of the first sprint, the design of the product or service to be delivered is developed in the form of a rough design. During the following sprints, details are added to this design. In this process, based on customer feedback, insight grows and plays a vital role. Each sprint results in the delivery of products or services. A build always fits into a sprint and is therefore also completed in the sprint in line with the acceptance criteria set down for a build in the Definition of Done. Each sprint results in the delivery of products or services. During the sprint, this result is tested in all ways and levels as set down in the Definition of Done. If desired and set down in the Definition of Done, a release can be split up into multiple sprints or can be completed in a single sprint. The release is completed in line with the acceptance criteria set down for a release in the Definition of Done. This also authorizes the actual ‘change’. It would be a misconception to believe that a good carpenter would also make a good foreman. The two roles are different. Sourcing governance requires unique skills that have little to do with the content of the activities being managed. Governance is the mechanism that ensures the right IT decisions (including investment decisions) are made in the right way and by the right people, and that these decisions are controlled. IT governance is about the structure of the control of IT. It involves setting down what is needed to facilitate good decision-making, including supervision to ensure its proper functioning. Without good governance, an organization is not able to make the right decisions consistently. Implementing IT governance, however, entails more than simply implementing a House of SIAM; it also involves changing human competencies, attitudes and behaviors. When designing this penthouse of a House of SIAM, it is important to set down well-defined roles and to set down which role participates in which consultations with which supplier and business unit, as well as which integration areas should be discussed at which meeting. Our illustration of a House of SIAM contains many roles and consultations. In practice, depending on the customer and supplier, and the related portfolio of services, the number of consultations can be limited. Q: What problems does the SIAM model actually solve? A: Today, most customer organizations trust multiple suppliers to deliver their services. It turns out that is difficult to get a new supplier on board, or to switch from one supplier to another. There are no standards for sharing information between the parties so that onboarding is a time-consuming and costly exercise. Customers are often expected to align their working methods with that of the supplier, given that suppliers usually work with standardized services. This hampers customer organizations in developing an integrated vision of the performance of all available suppliers. Moreover, the market is changing rapidly. The threshold for purchasing cloud services is low. To continue to be competitive, customer organizations want to be able detach themselves from suppliers – and engage new ones – quickly. Both customer organizations and suppliers benefit from a SIAM model that facilitates such actions. Once integration has been effected, the SIAM model provides guidelines as to how the parties can remain in control within the framework of their service provision. This includes mutual management and governance structures, roles, information sharing and so forth. Finally, SIAM makes clear that the services of different suppliers must be integrated in order to support the business in the right way. This requires cooperation and compliance with the contracts that must be in place. Q: Does the SIAM model work for all the different services that are purchased? A: Yes. Various typologies of services are provided. However, the degree of influence will differ (in both the contractual and operational phases) depending on the nature of the service. Some commercial off-the-shelf (COTS) services are purchased as a complete package. The customer organization can then exert very little influence on the services. On the other hand, there are also services that can be fully customized for a specific customer. Between these two extremes we have services that can be assembled and/or configured by the customer organization. Whether the customer organization is self-managed or follows the service provider has consequences for the entire lifecycle of the service. The SIAM model addresses these issues. Q: Is a House of SIAM a ready-for-use model that we can implement immediately? A: It is a reference model that describes the most important competencies and components that are expected to be in place within a customer organization and at a supplier. The aim is to use SIAM as a bridge between the two organizations. To this end, the model supports and offers insight into the ‘what’, but not the ‘how’. This is because the answer to the question of ‘how’ is largely dependent on the specific choices of the individual organizations. Q: Is the model specifically intended for customers or rather for suppliers? A: The SIAM model purports to be a reference model for both customers and suppliers. All parties benefit from standardization in this area. Even cloud providers will be inclined to provide more information about the delivery of their services when customers state that it is necessary for a trust-based relationship. Q: Does the model require a specific supplier tool? A: The model is agnostic. No specific tool is necessary, as long as the required functionalities are delivered. Q: When should I use the SIAM model? A: If a customer organization is considering outsourcing services to one or multiple service providers, the SIAM model offers the necessary reference information. For example, firm ground is created for anchoring the design of the SIAM framework in the IT governance organization. Q: Is the SIAM model the answer to how I should anchor DevOps and Agile in my organization? A: SIAM guides the way in which links are made between Agile/DevOps teams and the business, the IT governance organization and suppliers. Working with Agile and DevOps also requires governance agreements. In order to build an efficient and effective House of SIAM, processes, contracts and technology should be designed and implemented in an integrated way. Using integrated service management tools, information is received from all underlying parties. In this way, a single version of truth is created with which the IT governance organization can work. In addition to technology, the SIAM organization needs to have staff members available who are able to manage the operational processes and serve as a bridge between the business (demand) and the underlying service providers (supply).